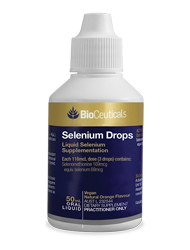 Need to increase your selenium intake? Try our easy-to-take liquid option with a tasty orange flavour. Three drops daily of Selenium Drops will provide the recommended dietary intake (RDI) for women and 97% of the RDI for men.